Jeannette Potts, MD, graduated from Lake Erie College for Women in 1983. She earned a Bachelor's in Liberal Arts with areas of concentration in fine art, biology and foreign language. She spent her academic term abroad studying French at the Universite de Caen in Normandy, France and conducting independent research at the Generalitat de Cataluna, in Barcelona, Spain. Upon graduating, she was awarded the prestigious IT&T Fellowship for Post-Graduate Research Abroad. She was one of only 23 college graduates in the country eligible for such an honor. She conducted independent research in anthropology, studying the natural occurrence of mummification in Guanajuato, Mexico for two years. Upon returning to the United States in 1985, she worked as an exporter of automotive parts and later of heavy-duty equipment in Latin America. It was during this time she applied to medical school. She attended Case Western Reserve School of Medicine, as quite the �bent arrow� (straight arrows went directly from a pre-med undergraduate education into medical school) from 1987-1991. The majority of her residency training took place at Grant Medical Center in Columbus, Ohio. She completed training at MetroHealth Medical Center in Cleveland, and her fellowship in medical urology at The Cleveland Clinic. She has been practicing medical urology at The Cleveland Clinic for the past 12 years. She has specialized in infectious disease, prostatitis and chronic genital pain syndromes in men. Her publications cover these areas, as well as voiding dysfunction and vasectomies. She travels extensively and internationally as an invited speaker/lecturer. More recently, she has been on a crusade to alert audiences of physicians as well as non-physicians, of the dying art of medicine. She has participated in the work of the International Prostatitis Collaborative Network and was invited to be part of the Consensus Panel in Giessen, Germany in 2002. She became a member of the Confederacion Americana de Urologia (the Latin American Urological Society) in 1998 and was elected to be Director of Education for this organization in 2001. She remains very active in this capacity. Dr. Potts was raised in a household where ethnic music seemed to be always playing. Her mother, a Mexican, and her father, a Polish-American, enjoyed dancing and usually included their children in many international events. Her grandmother, Lily, and her sisters could dance with Latin American or Eastern European men with ease at any venue. But they also loved hard rock music and disco. Growing up, Dr. Potts enjoyed hearing her grandmother's dancing stories. Lily and her boyfriend would go to all of the Fred Astaire and Ginger Rodgers movies, then practice the dance moves, subsequently clearing the ballroom in Mexico City, where they danced on Saturday nights. Lily was only 15 years old at the time. Her grandmother's love of music and dancing never ceased, and it actually flowed with the times. Whenever she visited, she encouraged her granddaughters to blast the latest tunes on the stereo and would join in with rhythmic gyrations that rivaled the teenagers of the day. When Dr. Potts visited her family in Mexico City, she was enveloped with sophisticated bohemians. Dancing was always part of the festivities, and she frequented nightclubs with her cousins, long before it would have been legal to do so in the States. She also took Tahitian and Hawaiian dancing lessons with her cousins. To this day, Dr. Potts can still impress her belly-dancing friends with the moves she learned with her cousins in Tahitian classes in Mexico City. While attending college and complying with two work-study programs, Dr. Potts would go out dancing at least three times a week. She discovered underground clubs, as well as early punk rock. Often, she and a classmate would drive to attend concerts by the Cleveland Orchestra at Severance Hall, and afterwards, slam dance at one of the inner city punk bars. She was a granola chick by day and a night-clubbing maniac by night. Needless to say, her friends were shocked when she graduated in only three years, one year ahead of her class. When she lived in Mexico, conducting anthropology research, she danced at least once weekly. Upon returning to the States, however, her dancing came to a mysterious halt, though she remained the closet dancer, or rather basement dancer, during her marriage. Dr. Potts resumed dancing several years ago. She especially enjoys the authentic salsa and cumbia dancing she experiences on her frequent business trips to Latin America. But no dance has ever captivated her the way that Argentine Tango has. She began taking classes in Cleveland in 2001. Soon she looked for lessons in every city where she traveled to give medically related lectures. She traveled to NYC for the sole purpose of taking lessons with Argentine Tango masters and the assortment of nightly milongas. News of her tango addiction spread through the Latin American Urological community, and during one of her trips as visiting professor in Mexico, one of her colleagues introduced her to his father-in-law, Eleuterio Rios, the president of the Mexican Tango Society. As a welcoming gift, he gave her more than 50 Tango CDs, �hoping to make you the best equipped tanguera in the U.S. and share gifts with one who also shares my religion: tango!� Their friendship, along with the music, is among her special treasures. She finally visited her Mecca, Buenos Aires, during the autumn of 2004. There she met yet another wonderful tango mentor, Mario Bournissen. 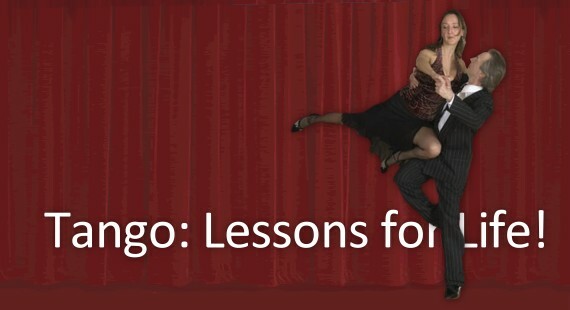 While describing her passion for the dance and the life lessons she interpreted from the tango, she realized the intrigue and curiosity she provoked in others. Even non-dancers became captivated by her vivid explanations and the passion conveyed by her eyes and body language. She walks ever so elegantly between two seemingly disparate worlds: the conservative medical world and the artistic, spiritual world of dance. It is through this journey and her frequent dance with others that she teaches us the Tango Lessons for Living!